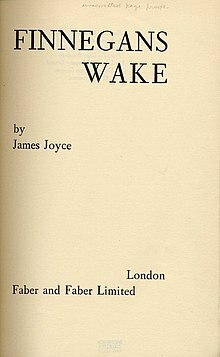 Finnegans Wake est mythistoria Lutetiae ab Iacobo Joyce die 4 Maii anno 1932 Anglice edita. Difficillimum opus somnium imitans clarum est ob experimentalem narrandi modum flumenque conscientiae. Prosa libri verbis portmanteau impletur somniorum ad experientiam creandam. Opus partibus quattuor structuram a Scienza Nuova, opere Vici, historicam sequitur. Quaeque operis partes revolventis progressionem historiae explorare conatur. Physica nomen particulae elementariae quark (scil. "quarcium") a Finnegans Wake primum ortum est. Gell-Mann, M. 1995. The Quark and the Jaguar: Adventures in the Simple and the Complex. Kitcher, Philip. 2007. Joyce's Kaleidoscope: An Invitation to Finnegans Wake. Oxonii: Oxford University Press. Samuel Beckett; William Carlos Williams; et al. Our Exagmination Round His Factification For Incamination Of Work In Progress (Shakespeare and Company, 1929). Joseph Campbell et Henry Morton Robinson (1961). A Skeleton Key to Finnegans Wake. Novissima mutatio die 25 Septembris 2018 hora 05:57 facta.